We are once again joining together with the NSW BDR team, leaving Dubbo on Friday, 10 August to participate in the Black Dog Ride to the Top End. Teams from all States will be leaving on or around that date with the goal of meeting up in Katherine and riding as the Australian Black Dog Ride team en masse into Darwin to raise awareness of mental illness and suicide prevention. 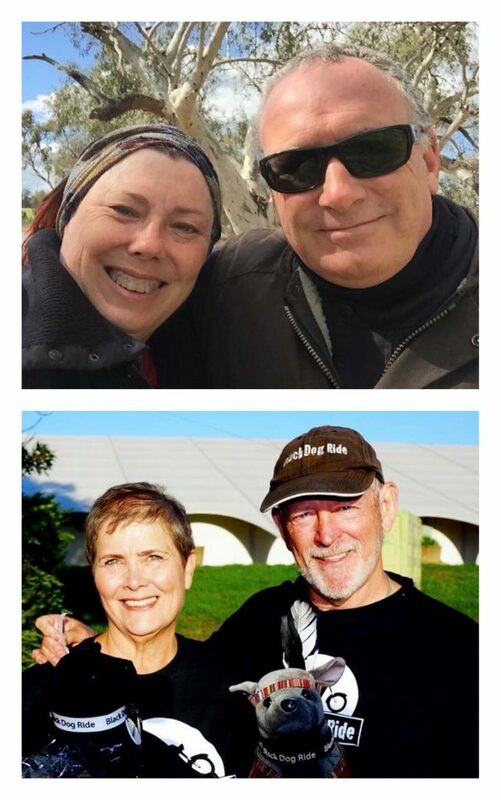 We are a personal fundraising team of three this year, with Sharon McInerney joining Marty and me and forming a close-knit team of riding mates. Unfortunately Rick McInerney can't make it this year but don't worry Rick, we'll look after Shaz just as we know she will look after us. Why do we do it? What do we get out of this experience? I love participating because of the amazing sense of achievement it gives me. It's my impression we all share two passions, a passion for motorbikes and a passion for the BDR message. Some of us live with depression every day, some of us live with those who live with depression, some of us have been touched by the devastation that comes with losing someone we love to suicide. One of the biggest and most important draw cards to these rides is the camaraderie the Black Dog Ride family share. We are all there for each other; we understand; we don’t judge; we care. I’m never great with words about why I do something. I joined the black dog ride to support my wonderful husband Richard who has depression. Motorcycle riding was one of the few strategies for him in the early days and thus the black dog ride meant that we could share our experience in the hope of reducing the stigma whilst enjoying our love of riding. I’ve worked in mental health for more than 30 years. I’m passionate about helping others and having these crucial conversations. This ride for me is about supporting those around me, reducing stigma and remembering those that we have lost. Early in 2015 I saw a promotion for the Black Dog Ride (BDR) to Uluru raising awareness of depression and suicide prevention. Thinking it would be a great ride I mentioned it to Janine who had been having her own struggle with depression. After discussing it, we decided to commit to the ride and also all that BDR stands for. We had been on one day rides before, but this was a major commitment. I really wanted to join the ride in support of Janine and other friends and family members living with depression. Raising awareness under the BDR banner has become the norm with us as we usually don our BDR gear whenever we ride. We are always being asked about BDR and we do our best to be effective ambassadors for the charity. Starting conversations in communities along the way is a great way to help to remove the stigma attached to mental health, encouraging those we meet to talk freely and without judgment. Bloke approached Marty at fuel stop in Townsville. He was keen to talk, had seen the bikes travelling through and was impressed with the cause and what we were doing. Love you Marty and Janine. Supporting your BDR efforts. Four weeks to go, let 's get this started! !